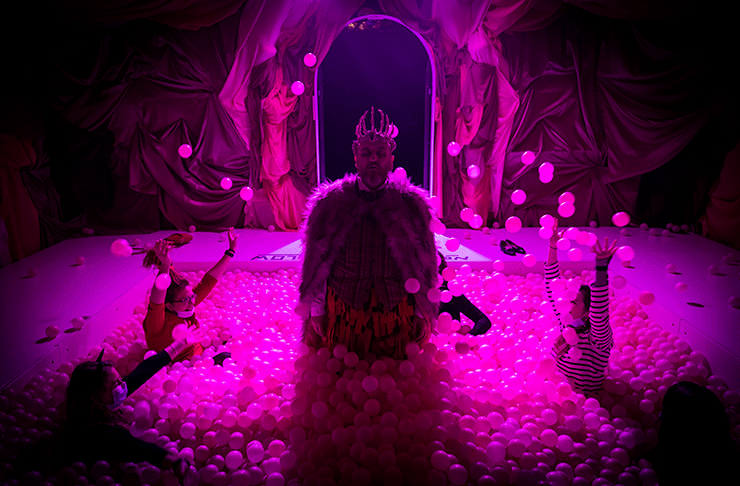 Perth's adults-only playground, A Midnight Visit, has just extended its season to 3 March, so if you haven't been yet you need to secure tickets now. Need to know more? Here's the lowdown on the fully immersive event in an abandoned castle. Think 34 rooms stretched over three stories. Produced by Broad Encounters, A Midnight Visit is part choose-your-own-adventure, part film-set, part performance, part sound-world and part bloody playground. Once inside, you’re let loose to encounter gothic characters, surreal dreamscapes and scenes guaranteed to get your adrenaline pumping. There is even a church with a millennial pink ball pit (yes, you can play in it). A neon forest, a hot air balloon, a mysterious king and a whole lot of scary veiled ladies. The old Perth Girls School (the same place that turned into a boutique cinema last winter) will play host to A Midnight Visit and bring the unique immersive theatre to life. Get ready to unleash your playful spirit as the space transforms thanks to the talent of multiple artists, sound designers, set designers and even video game makers. This real-life fantasy is set inside a legendary man’s dreams (he went by the name of Edgar Allan Poe and if you paid attention at all in high school, you’d know he wrote some of history’s most chilling tales) which means themes will revolve around madness, guilt, death and memory. And while it is a little spooky at times, it’s plenty pepped up with sass, humour and burlesque pizzazz with contemporary influences drawn from Stranger Things and New York’s iconic theatre experience, Sleep No More. It's probably worth noting that there’s a safe space to quench your thirst, called ‘The Ravens Rest’ (an ode to one of Edgar’s poems), which is a bespoke pop-up bar where you can have a well-earned drink at the end of the immersive event. So make sure to grab your tickets for the show here. Editor's Note: This article was produced in partnership with Fringe World Festival. To find out more about who we work with (and why! ), read our editorial policy here.